Before the post begins (or after you read it), if you would like to donate to my 2014 CHA Fundraising, please click this link. 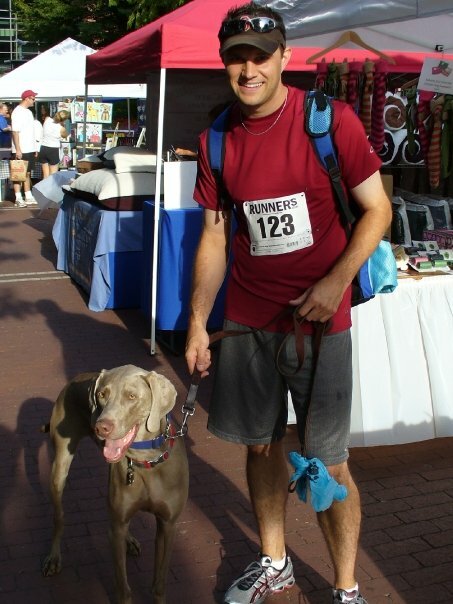 My first Citizens for Humane Action Dog Jog was in August 2008. It’s something I’ll never forget. The day before the race, my divorce became final, then, in a horrible twist of fate…. my grandfather passed away a few hours later. It was, without question, one of the worst days of my life. I had signed up for the Dog Jog a few weeks prior because I wanted something to look forward to and thought this would be a good distraction. When I arrived at the race, I found my good friend, Billy. It was great to have some support at the race. You can see from the picture how young and thin I was. Tobey was so happy that day. And I felt great helping homeless animals. It was exactly what I needed. We ran 5k in 23 minutes and 34 seconds (7:30 average). I’ve kept the Dog Jog on my Calendar ever since. I even showed up with a severely sprained ankle one year. I didn’t run, but I was there. I’ve raised more than $3,400 since my first race. I started bringing my Lillian and the woman who would become my wife. The event morphed into something I looked forward to every year. Something I could do to give back to the animals that can’t help themselves and something I could do with my best friend Tobey. This year, Tobey is turning 9. It’s something that I’m having a hard time with. He’s started to slow down physically, which breaks my heart. It takes him longer to recover from runs, and he can’t go as fast as he could before. That’s why this year’s Dog Jog is so important to me. There is a real chance this could be the last formal run we do together. We likely won’t beat our personal record (22:35 in 2009), but we will remain committed to the cause. We’re going to show up and we’re going to have an amazing time helping other dogs. In the end, that’s what the CHA Dog Jog is all about. If you’d like to contribute to my cause, you can do so here…. if you’d like to leave a note, please use the comment box below. Since the weather has been warming up lately, I’ve started running again with the Superfriends. 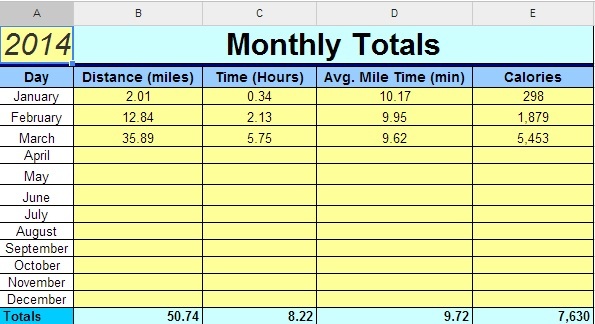 I started in February with a modest 6 runs for close to 13 miles. Once the snow melted in March, I’ve been able to kick it up a notch and have 13 runs under my belt for nearly 36 miles. My 2014 log is below. If I run outside, I always take at least one of the Pups. This year, I’ve been taking both of them. If they’re being good, I’ll let them run around off leash. It’s usually harmless as they sniff everything and have a great time running around. This leads to today’s run when I let them off leash and they encountered a skunk. I had them running next to me because we were coming around a bend and I didn’t know what was ahead. Once the coast was clear from people and dogs, I told them to run ahead. They both took off at full speed up a hill. I couldn’t see what was going on but I could hear intense barking and I could see fur flying in the air. I immediately started sprinting to see what was going on. When I got within sight, Lillian was rolling on her back on the ground and Tobey was attacking a skunk. I immediately started calling them back to me to get them away from the skunk. Lillian came first and I could smell that she had gotten sprayed. Tobey really wanted to avenge his sister so he was still attacking the skunk and refused to leave. Once I got his attention, I called him back and immediately got him on the leash and headed for home at an increased pace to assess the damage. Of course, I had none of these things on hand so I tied the dogs to the front door and rushed to CVS to buy the supplies. I mixed everything up and did a quick assessment of the situation. As I mentioned, Tobey avoided getting sprayed. He kept licking his chops so I think he managed to get a few good bites in. Since he didn’t stink, I got him inside and started using the solution on Lils. After several minutes, the smell was still in the air, but Lillian was ok. I washed her off and got her in the house. Since the house had a smell, my next move was to rush to the grocery store to get some vinegar to boil to neutralize the inside smell. I got back, I put it on the stove to boil and proceeded to give the pups real baths. In the end, the house still has a slight smell. I can’t tell if it’s from the vinegar or the skunk… but more importantly, the pups don’t smell and the formula worked like a champ. If your dog ever gets skunked, I highly recommend the formula above and the below video. If you have any thoughts on Lil getting skunked or any other tips or tricks, please drop a comment in the box below. 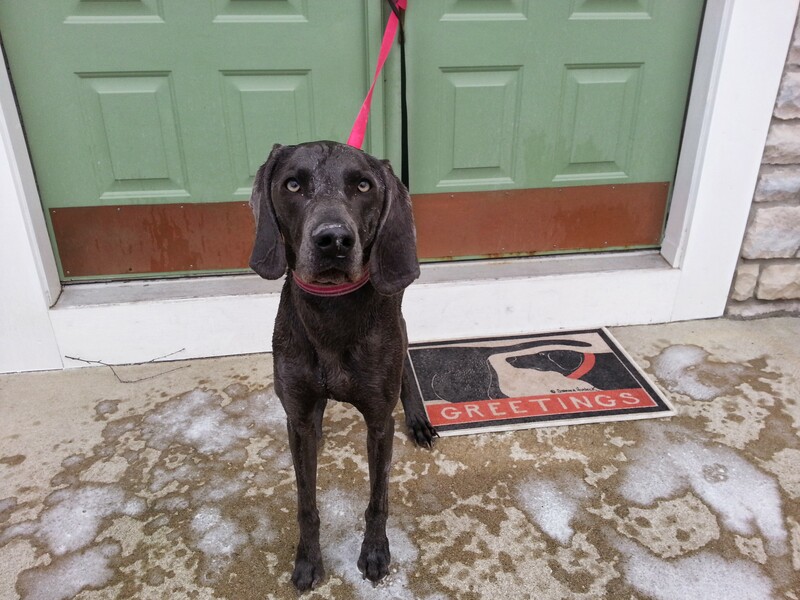 Let me start by saying that I love running with my weimaraners. I love the company and the pure excitement for running. I would go as far as saying that running is one of Tobey’s favorite things in life (Lillian’s is eating). It’s gotten to the point where it’s almost unbearable for me running alone. One of my events I look forward to each year is the CHA Dog Jog in August. Since 2009, Tobey and I have raised close to $3300 for homeless animals in and near Columbus (although… to be fair, Tobey hasn’t done much fundraising). Anyway, I usually try to take both pups when I run. 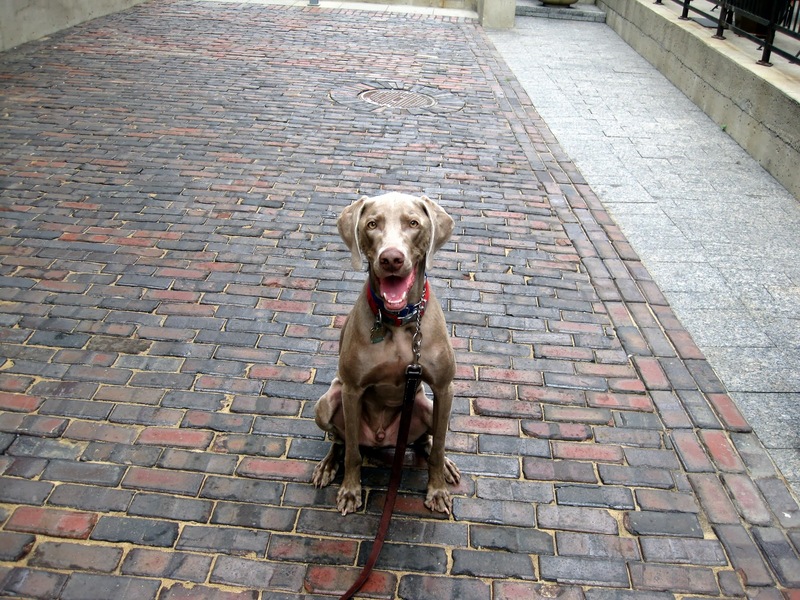 Lillian (our Blue Weimaraner) runs on the left and Tobey (our Gray Weimaraner) runs on the right. 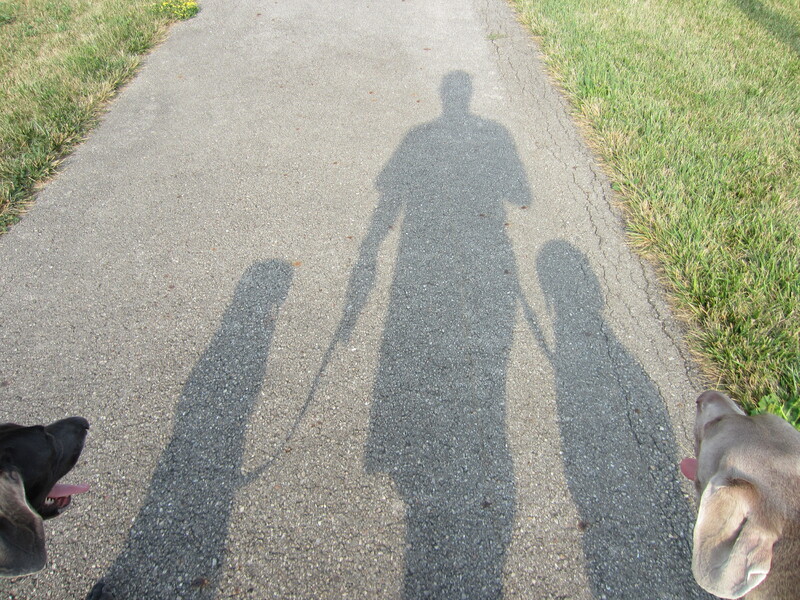 This adds a level of complexity because I don’t have full use of my arms because I’m holding the leashes. If I’m going for a long run or if I’m tired, my preference is to roll with only Tobey and leave Lillian behind. This is what happened the other day. Thankfully my wife recorded Lillian’s reaction to us leaving her behind. If you want to drop a note about how sad Lillian sounds or how cruel I was for leaving her, please use the comment box below.